This is the month that makes us all go a little mad. You know what I mean. This morning is a perfect example. I woke up to sunny skies offering a brightness that hints of Spring to come. Now, two hours later, it’s cloudy. The winds have picked up, and I really don’t want to go outside. Weary of winter, brown, dingy remnants of the most recent snowstorm, not a lot going on in general. That’s March. Do you generally like to stay busy all the time? Do you typically prefer not to be home alone? Do you feel restless when you’re not doing something? Is it hard for you to sit down and watch TV or read a book? Do you feel that you need to be productive at all times? Do you require constant entertainment: the TV on, music playing, or someone to talk with? You may be wondering what all these questions have in common, so let me explain. There is a subset of the population who feel pressure to stay busy all the time. Be productive, move around, don’t sit still. I have come to realize that there is a surprising explanation for this particular mindset. It’s not society, technology, inner resourcefulness or drive. 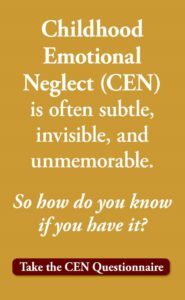 It’s actually Childhood Emotional Neglect. Here’s how it works. When you grow up in a household that’s blind to emotion, you don’t learn the skills necessary to accept, identify tune in to, or express your own emotions. Emotions which aren’t dealt with and managed go underground, pooling together inside of you like a pot of soup. This “soup” simmers away outside of your awareness. Out of sight, out of mind. As long as you stay busy, driven, focused on things, distracted, you don’t have to feel those feelings. But it’s those alone moments when there is nothing to distract you that the feelings start to bubble up. I have seen this lead to great discomfort in many people; a feeling of restlessness and discontent that is difficult to sit with. This is what makes March a particularly difficult month for the emotionally neglected. When we’re trapped inside, suspended between winter and spring, we are forced to sit with ourselves. It is a challenge which we can either run from or face. I say, let’s take it on. 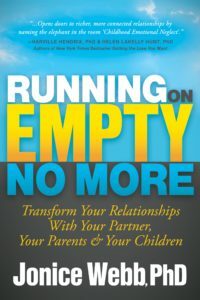 My book Running on Empty has 3 chapters dedicated solely to helping emotionally neglected people learn to tolerate, accept, name, manage, and express emotion. Here I’m going to share with you an exercise that I often assign to my emotionally neglected patients. It’s designed specially to help you learn to tolerate your pot of soup, a skill that will help make your life more peaceful, calm and emotionally connected. Step 1: Close your eyes. Picture a blank screen that takes over your mind, banishing all thoughts. Focus all of your attention on the screen, turning your attention inward. Step 5: If you’re having difficulty identifying any feelings, you can google “Feeling Word List,” or use the Feeling Word List in the Resources section of Running on Empty to help you identify what you are feeling. Set a timer for 1, 2, 3, 5 or 10 minutes, whatever you think will work best for you. Repeat Step 1: Close your eyes. Picture a blank screen that takes over your mind, banishing all thoughts. Focus all of your attention on the screen, turning your attention inward. 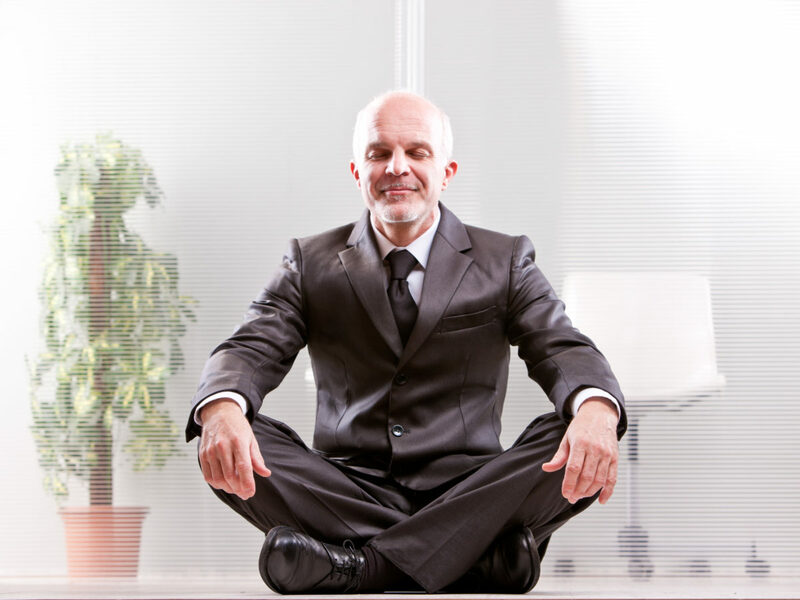 Here, you are using Step 1 as an exercise to learn how to sit with yourself and your feelings and tolerate them. Do this as many times per day as you can. The more you do it, the better you will get at it. At some point, you will be ready to go back and try Steps 2 through 5 again, and it will be easier this time. 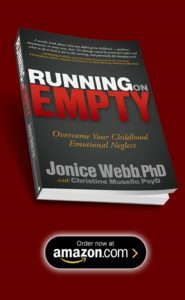 Bottom Line: Emotions are a useful, vital, biological part of who we are. They cannot be erased, and they will not be denied. We can make them our friends or our enemies, but we cannot run from them. If you’ve been running from your feelings, turn around and face them. Learn to sit with them, express them, manage them, and use them to make decisions. Allow them to enrich and enliven your life, and you will feel more connected, more fulfilled, stronger and overall happier in the end. Put an end to your March Madness.